In testimony to the United States House Judiciary Committee, Google’s representative revealed four facts about how Google’s algorithm worked. She discussed topics ranging from one related to RankBrain to how often Google tests its algorithms. RankBrain was originally created to understand the 15% of the queries that Google has not seen before (it has since been added to cover “every query.“) . It has been generally assumed that these 15% never before seen search queries were more or less new ways of searching for the same thing, long tail search queries. It turns out that those unique queries are more than just long tail search queries. Juniper Downs’ testimony to Congress reveals that the 15% of unique search queries can be comprised about current events. This is a strong clue that the 15% of never before seen search queries may relate closely to current events. Optimizing for RankBrain has generally been a debatable topic. Most reasonable search marketers say that as long as your content is clear for the regular algorithm then it should be just fine for RankBrain. Optimizing for RankBrain is not something that can be specifically targeted. This revelation about at least some of the 15% of unique search queries reveals that indeed, there is no specific strategy for RankBrain. It’s possible that RankBrain queries are strongly associated with current events, new products and upwardly trending topics, as well as expanded to help understand concepts. How do you optimize for that beyond standard SEO content practices? Aside from news organizations monetizing ad impressions, who else could have monetized the soccer team trapped in a Thai cave? Nobody. It’s a poor candidate for search optimization. If this example represents the typical 15% of unique search queries, then worrying about and optimizing for RankBrain may not be a good use of time. The Googler’s testimony did not state what legal reasons Google would use to penalize a site to prevent it from ranking. Nevertheless, this is an area of the algorithm that is not considered often and is worth a quick read. What legal reasons could she be citing? One reason could be related to copyright. Another reason could be the right to privacy. There may be other reasons related to laws specific to an individual country. In 2017 Google conducted over 270,000 algorithm experiments. That adds up to approximately 740 search experiments per day. Out of all those experiments, 2,400 changes are kept and become a part of the search algorithms. That equals to approximately seven updates to Google’s algorithm every single day. There is a trend in the search community to ask Google about updates to the algorithm. 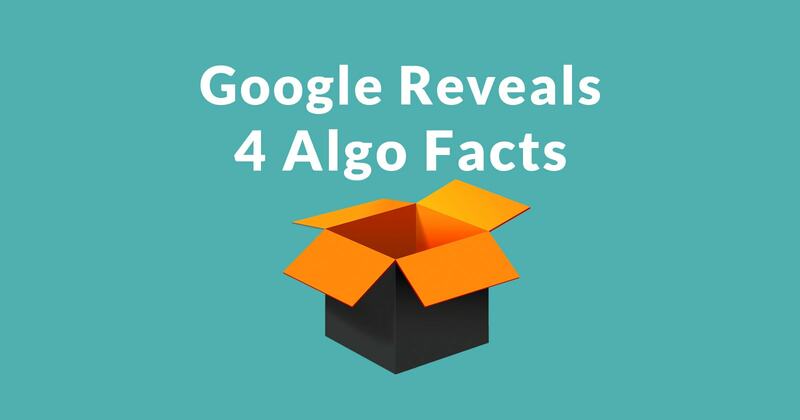 The truth, as revealed in Google’s testimony, is that there are on average approximately seven updates to Google’s algorithm every single day (when averaged across every day of the year). Google’s representative revealed that their external Search Quality Evaluators are used to evaluate the algorithm experiments along with live search results. She also mentioned that Search Quality Evaluators come from diverse geographies and backgrounds. It is presumed that this is a reference to different languages and countries. In addition to the algorithm related facts, Google’s Director of Public Policy and Government Relations revealed interesting facts about the earning potential for video content creators. Juniper Downs highlighted how YouTube is an economic engine, democratizing the creation of video content. Video Content creators earning over six figures of income experienced 40 percent over last year. Useful facts about Google are available outside of regular developer channels. Juniper Downs’ testimony revealed interesting facts about how their algorithm works and what areas of content creation are lucrative.